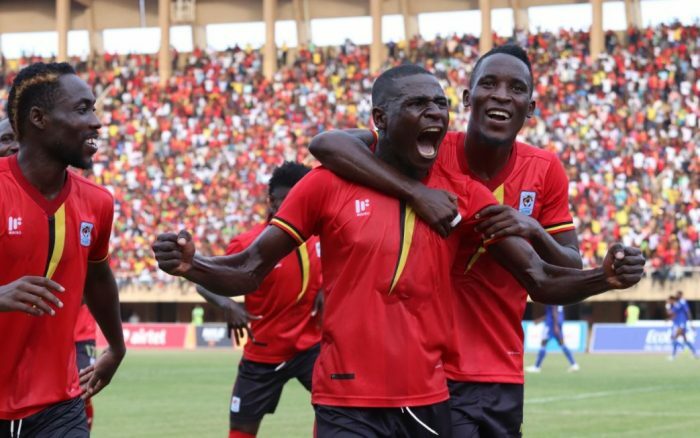 KAMPALA – On Saturday, Uganda beat Cape Verde 1-0 to book an early berth in next year’s Africa Cup of Nations finals in Cameroon. Head Coach, Sebastian Desabre leaped with joy when the centre referee blew the final whistle to seal Uganda’s place at the June 2019 tournament. There are several positives to draw from the somewhat cagey victory. 1- The Emergence of Patrick Kaddu. In only his third ever full international game, Kampala Capital City FC forward Kaddu led the line with distinction. His blossoming understanding with Farouk Miya must be the principal reason Desabre chose Kaddu ahead of Austria based Edrisa Lubega. Besides, the KCCA FC front man’s running behind the lines was exemplary. Can’t recall a Cranes striker who has beaten the offside trap in a crunch international more often. By the time he took his goal, the 22-year-old had put in a good shift by his clever running, incessant pressing and powerful leap. 2- Disregard Fifa Rankings: Just before Matchday Two, which marked Desabre’s AFCON qualifiers bow, global football governing body released rankings which put Cape Verde in 65th place, 18 positions ahead of Uganda. The Cranes would definitely not have been able to beat the West African islanders home and away had they allowed Fifa’s rankings to prey on their mind. Matter of fact, even Tanzania’s Taifa Stars, who are rated over fifty positions behind Cape Verde, could still qualify at their expense. 3- Developing Total Football: The ease with which Kuwait based Denis Iguma slotted back into the holding role, just weeks after playing a starring central defensive role in Cranes’ 2-0 victory over Lesotho, was a joy to behold. Going forward, coach Desabre shouldn’t be averse to switching Iguma and Hassan Wasswa Mawanda during games. For instance, against Cape Verde, it was apparent Wasswa was finding it hard to keep track of danger man Jose Semedo ‘Giannini’. An easy way around such a conundrum would have been to ask Iguma to have a crack at tracking the effervescent forward. 4- Clean Sheets Cranes Biggest Weapon: Uganda is yet to concede a goal with only next March’s duel with Tanzania to go. Defense has been the bedrock of Cranes’ continuing growth into a continental force. In my book, Uganda’s defenders deserve more plaudits for consistently making hay of Africa’s top strikers. Even in their ultimately unsuccessful bid to qualify for last summer’s World Cup in Russia, Uganda only let in a continent equating two goals. 5- Kateregga Best Left Sided Midfielder: Though El Hadood leftie Isaac Muleme tried his best to fill the position vacated by Joseph Ocaya, his overall performance left much to be desired. Cape Town City star Allan Kateregga’s stellar display in Maseru is the best we have seen from a Cranes player in that position in years. Going forward, rather than keep rotating between Muleme, Ocaya and Kateregga, Desabre must teach the South Africa based stylist how to mind his defensive responsibilities. That way, the Cranes can maintain their midfield balance without losing their aesthetical appeal.